Well, we bought another tandem bicycle. This one feels easier to ride (meaning it's a little shorter and it's wheels are a little fatter) and it's in much better cosmetic shape. Basically, we couldn't pass it up. Johnny and I picked it up from a neighbor friend on Sunday and I have not stopped thinking about it since. I don't know if you've noticed, but I have a bit of an obsessive personality. Hope mustered up all of her braveness this evening and I took her out for a ride. The only thing better than an evening bike ride is doing it with a partner! This is so cute. I don't know how to ride a bike, but this makes me want to learn, and your outfit is so sweet. Tandems look so fun! Especially with not much traffic around! Wow I have never actually seen a tandem bike in real life I think, this one looks so beautiful and you make it sound a lot of fun, though! Tandem bikes are the best! I bought a tandem bike as a present for my boyfriends birthday last year; we love cycling on it together and going for pick nicks and adventures! Love the pinafore with the turquoise tank :) Oh! and that tandem bike is wonderful. 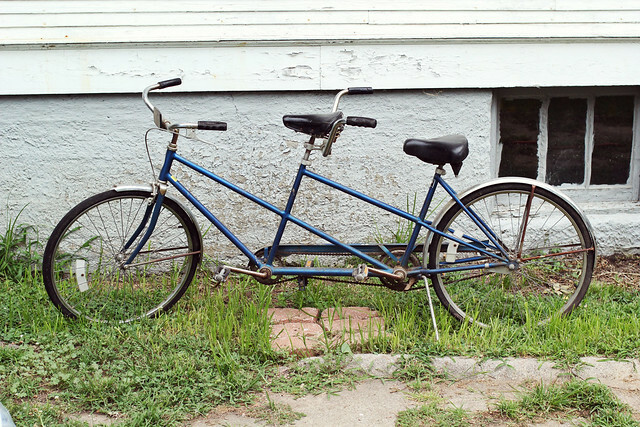 I've never tried the tandem, a stroll with "my partner in crime :P" sounds very nice; I definitely must try! Ha! What a fun thing to get. What an awesome find. I have always wanted one of those. You and your hubby look so cute riding it too. I love this bicycle so much! My husband has just built me my own bmx for the summer, tempted to ask him to make a tandem! What a fun purchase! It,s perfect for private little dates with your husband or older children. You've made me want one now too. pretty sure I've said this before, but I seriously love how pretty your red hair is. and that tandem bike is super cute! Oh and also super cute outfit!!! That dress is adorable! And the tandem sounds like so much fun! Some of my favorite childhood memories are riding around on my family's tandem with my dad. I bet Hope had a blast! love that bike! and that outfit?!?! so cute!!!!! I also have an obsessive personality, and didn't know that anyone else ever used that expression! Your outfit is adorable (as usual). And you are brave to ride a bike in a skirt! You look a little bit like Kate Mara (from happy thank you more please) in these pictures! I love the dress. Your hair is beautiful, and SO is that bike! How fun! You two are the cutest couple, love the tandem bike! 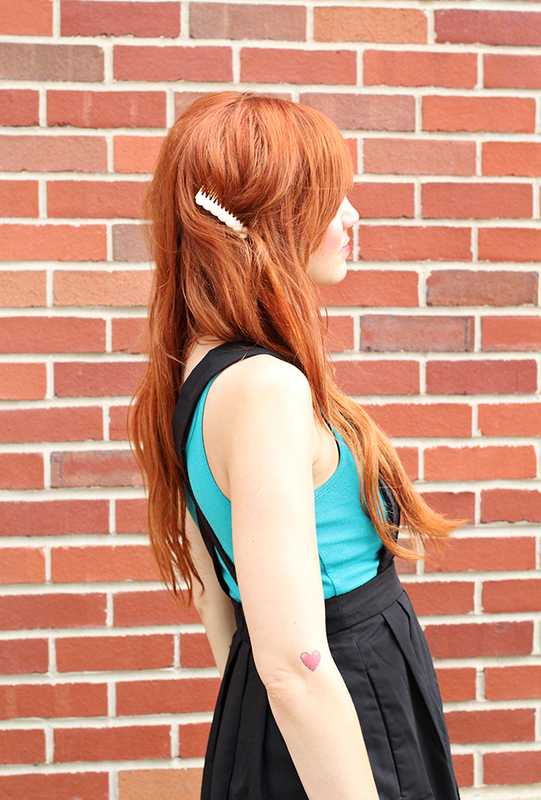 That dress is so cute - and I'm loving those hair clips. So cute! Also, that bike is so awesome! I need to find me one of those! Ahhh that's so cute!! Is it hard to ride a bike with two people? Oh wow! FUN! :) I've always wanted to try tandem biking. You're outfit is super cute too! this is beautiful and love that bike shot! That dress is so cute - and I'm loving those hair clips. adorable! everything is too cute :) love the last image.